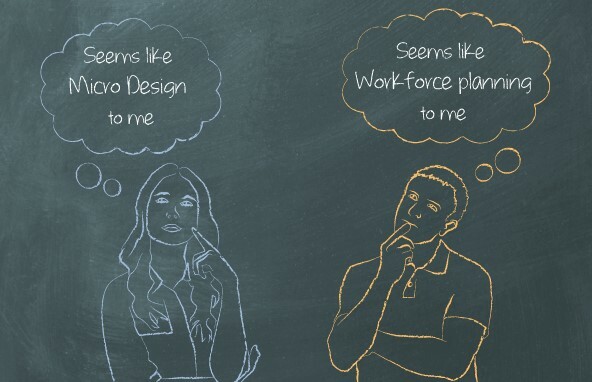 What is the difference between Workforce Planning & Micro Design? What is the overlap and difference between Workforce Planning and Micro Design? Ensuring you have the right number of people with the right competencies in the right roles at the right time and place. Is that Workforce Planning or Micro design? Seems like Micro design to me… also seems like workforce planning to me. So, what is the difference? Below is a list of the five main differences. Micro design happens every now and again. It is one of those stand back, work it through types of activities. Workforce planning (and management) is constant. Employees are constantly moving on to new roles or organisations. It is constantly in flux and needs constant management. In other words, Micro Design is more strategic in nature. It is about defining where you need to go. Workforce planning & management is about getting you there. They are therefore totally symbiotic. They need each other. Doing workforce planning without a clear Micro Design is like driving somewhere without a map or even a destination in mind. It is all in the words. Micro “Design” is just that: designing and defining roles. Roles are made up of objectives; accountabilities; competencies; number of FTEs required for each role; where the role sits organisationally and where the role reports to. The end result is the “Job Spec” or “Role Description”. Workforce Planning is about who will fill the role. It is about people. It is therefore about compromise because there is rarely a perfect fit between the list of candidates and the job description. Knowing what is truly essential vs. desirable in order to make trade-offs between candidates is a large part of the selection process. Moving on from recruitment to Learning & Development, what training needs to be provided to close the gaps between this ideal and actual competencies? What competencies need closing in what order? How do you even know they have been closed? In other words, Micro design is about the ideal. It is defining the perfect solution. But reality never lives up to that perfect image. There are always rough edge and human frailties. This is why there is a limit to what can be done by a machine or software programme. Judgement always needs to be applied. What is the As-Is situation and the To-Be design? How and where do they differ? What are the improvements? How big is the change? What is the impact going to be? How many FTEs are required by role by geography by month/quarter? It isn’t just about two states (As-Is vs. To-Be). It is about the transition of those states, broken into months/quarters into the future. In reality, the To-Be will never be reached because too much changes. The whole concept of “steady state” is a misnomer. In fact, knowing how the plan changes is pretty insightful and worth reflecting on. One of the questions a colleague asked me while reading a draft of this blog was why bother with the distinction between the two things? The term “Workforce Planning” is a highly used and recognised term. It means a great deal to a great number of people. In that context, we are also defining a new term, “Micro Design”. Micro Design is one of the 3 elements of our Organisation Design process – Macro; Micro; Making it Real (MiR). Because there are overlaps, I thought it was important to distinguish between the two. This then provides greater clarity on what each separate term therefore means. The difference helps understand each concept. In summary, the two concepts are closely related. Ideally the Micro Design should lead to workforce planning and management. Both cover the detail of making an organisation work. But they are distinctly different. Design vs. Execution; Strategic vs. Operational; Ad-hoc vs. Ongoing… good design will make implementation workable and implementable. Workforce planning and management are crucial elements in the implementation. In all likelihood those doing the design won’t be doing the workforce management. They may not even talk nor understand the impact they have on each other. Given how closely linked these two activities are, one wonders how successful either can be without the other?